The highest performance MCT model, designed for industrial use and double cigar cabinets. MCT Xl restores humidity blazing fast after opening a humidor cabinet. However the extreme performance must be regulated, it should be used only with well-constructed air ducts, and highly recommended to be installed only by experts. Maklary Humidors uses MCT XL in their luxurious humidor cabinets. Uneven humidification is among the most common problems that could decrease the quality of your cigars. In many cases, different humidity levels in humidors are due to an improper measurement mechanism. Sensors are generally directly attached to the humidifier, and measure humidity levels on the side of the machine. The upper region of your cabinet therefore hardly ever gets enough moisture. In every MCT cabinet humidifier (M, L, XL) therefore the sensor is separate from the humidifier and is placed in the control panel. This way, humidity can be sensed at any place in your humidor, depending on where you place the control panel. Reliable and accurate measurement is a key factor of humidification. We rely only on the best, precision capacitive Swiss sensor from a world leading sensor manufacturer. The large, easily readable LCD comes from Germany, the computing unit from the USA. To avoid accidental or unwanted changes in the settings, a two stage menu system is applied. In the first stage you can set the humidity, while in the second, hidden stage, you can fine tune every function related to operation and calibration. 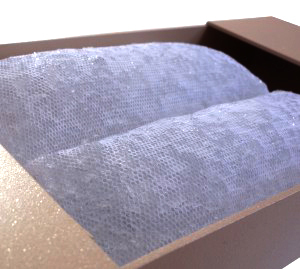 Instead of pouring water into the machine MCT humidifiers contain acrylic-polymer gel packs to ensure humidification. The patent pending technology was invented by MCT, to dramatically increase efficiency and lifespan. The material is 100% inorganic, therefore mould and bacteria free acrylic-polymer. 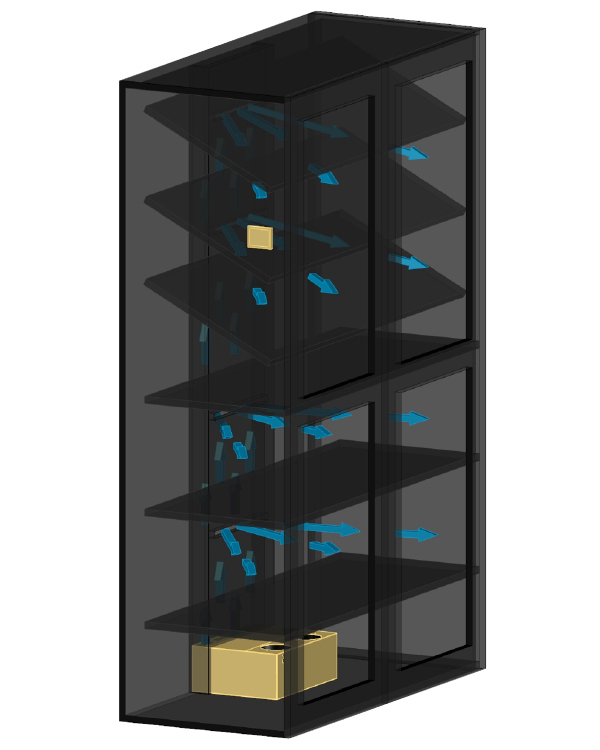 Our patent pending solution is to put the acrylic crystals into our special net, that once thrown into water swells up to form the cylinders of a pack. The MCT gel pack can be used for years, without replacing it! In MCT XL, three layers of gel packs lying on positioning grids – 8 cylinders each – are responsible for the increased humidification performance. MCT XL has 6 times bigger humidification surface than a usual, tank-type device filled with the same amount of gel. To ensure efficient operation, air ventilation system is indispensable in all MCT humidifiers. The other important function of cylindrical shaped gel packs is that the air can stream through fast, there is no barrier to slow it down. Thanks to the huge humidifier surface even the rapidly flowing air picks up a great value of moisture. 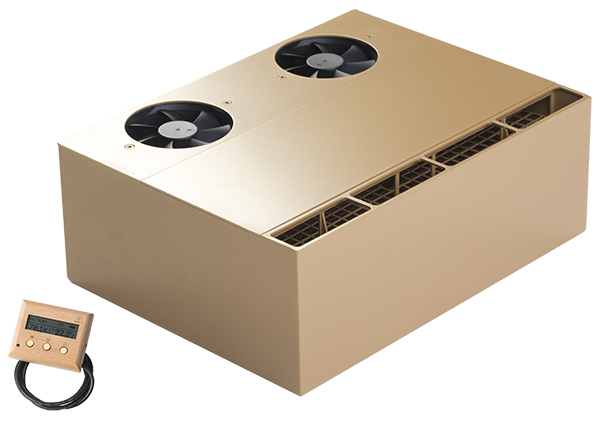 Premium quality silent fans and minimalized air noise make you MCT whisper quiet. MCT XL has 4 large air outlet openings of which all the 4 should be used to reach the performance. Guiding the ventilated air can be achieved by using specially constructed air ducts. MCT XL was created to work properly without any additional fans, water tanks, etc. However, using it without an air duct is only recommended for industrial use in a cabinet that is not higher than 4 feet. In every other case an air duct must be used. If you own a humidor that has an air duct or double walls, MCT is the appropriate humidifier for you. All MCT models are designed to work excellently with any kind of air guiding implementation. If you experience that the humidity level is always above the set value, periodic ventilation may be the solution for your problem. It is possible to regulate the intensity of the humidification by continuously adjusting the fan speed. MCT models are powerful, if you place them into small humidors, often slower speed can yield the desired outcome. When a humidor lid or door is open, the inside humidity automatically decreases, so the sensor turns on the machine. 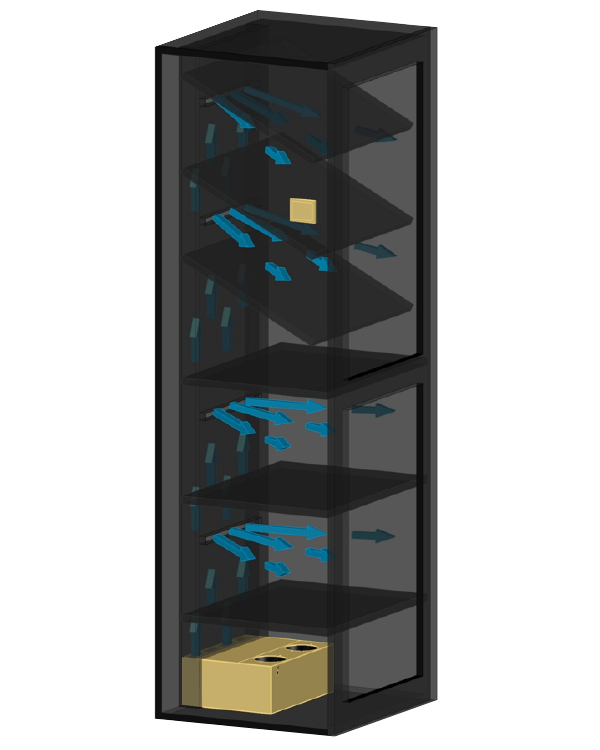 In many cases, for example when the humidor is packed full of cigars, excessive moisture is generated inside, keeping the humidity constantly higher than the set value. The Door open function does not start the machine while the door is open eliminating the undesired over humidification. Every MCT control panel is a masterpiece, made of one piece solid Spanish cedar wooden block, CNC forged and laser cut, hand polished. It was designed to match in style even the most exclusive humidors. The buttons are custom made from one piece of aluminium. The control panel can be mounted magnetically by the supplied accessory. The body of each MCT humidifier is made of a 100% water resistant light metal, Aluminium-Magnesium alloy, to last for a lifetime. They are painted to maduro brown, cream gold and cedar beige to match the interior of a humidor. Our philosophy is to produce extremely reliable machines that work for decades. Using the best quality parts secures a rock-stable operation. Each MCT model is tested thoroughly before packaging. The body is made of metal. The control panel is detachable, in case of any defects it can be easily and cost-effectively repaired or replaced during the 3-year warranty, and beyond.